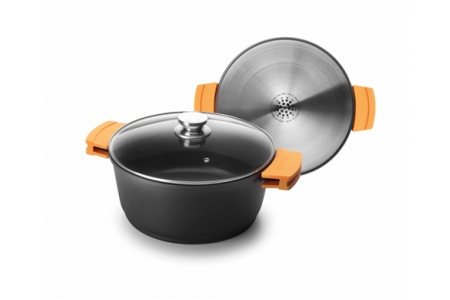 Reinforced non-stick coating PFOA-free, harmless to human health and enviromentally friendly. Stainless steel base across the ENTIRE surface. Enables maximum heating efficency on induction hobs with the resulting energy saving, as well even cooking across the surface. Removable silicone handles with a soft touch finish providing heat insulation and enabling easy cleaning. Tempered glass lid resistant to 230 ºC, with vaporiser. 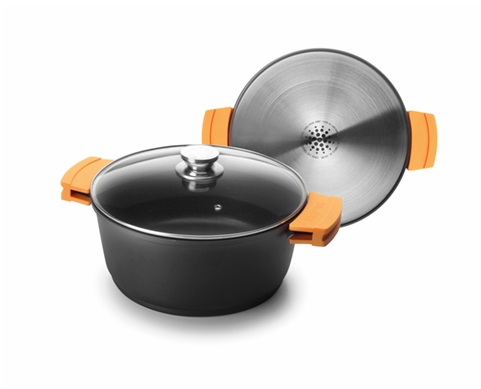 Suitable for all hobs (it is recomended not to attach the silicone handles during cooking in order to prevent overheating. Always use the silicone handles when moving the pan). Ovenproof (preferably put in the hoven without the handles in order to prevent overheating). Patented FULL INDUCTION base system.